Snowshoe socials were once a winter pastime in rural New Brunswick. Scarce daylight hours meant getting creative when it came to community activities. And daytime responsibilities limited what could be accomplished. Families made the most of winter by hosting evening hikes, followed by food and hot drinks. It’s that kind of old-fashioned hospitality and entertainment that inspired Denise Howlett and Gig Kierstead—owner/operators of Elmhurst Outdoors—to offer Moonlight Hikes for their customers. They have hosted the hikes for almost five years now, and it’s been a hit since day one. The hikes book up quickly and they have to turn people away. At $15 per person and $7 snowshoe rental, it’s an inexpensive night out. 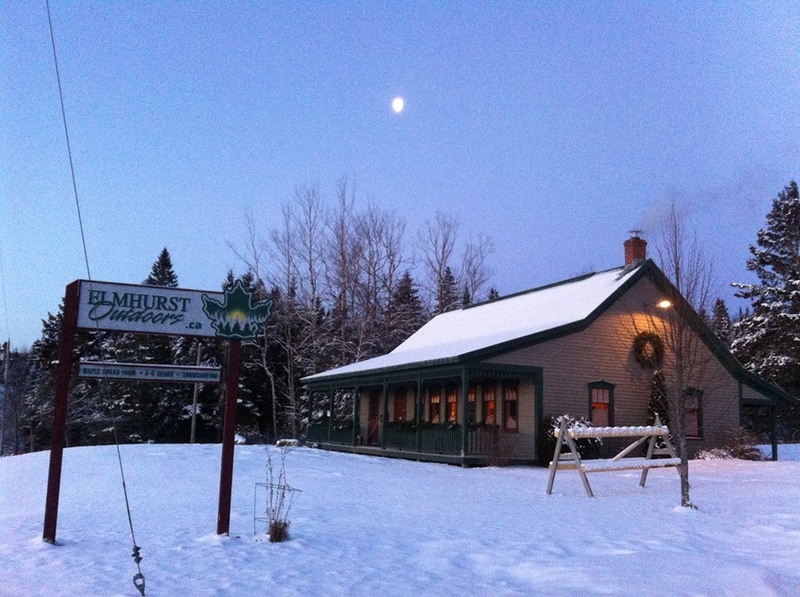 Ten kilometers (six miles) of groomed snowshoe trails meander through the sugar bush and old farmland of Elmhurst’s substantial acreage. 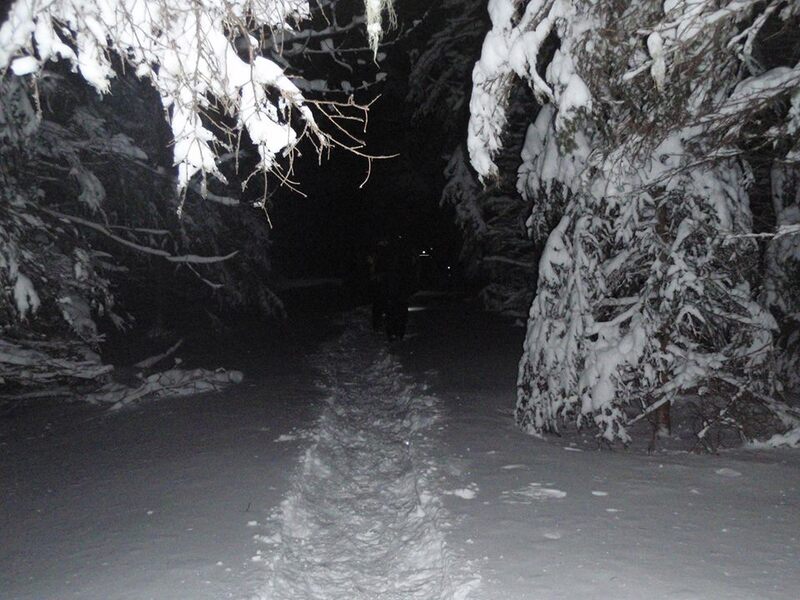 The moonlight hike takes in two and a half kilometers (about one and a half miles) up the ridge behind the lodge. It’s not meant to be a workout, but the terrain could be a challenge to the uninitiated. 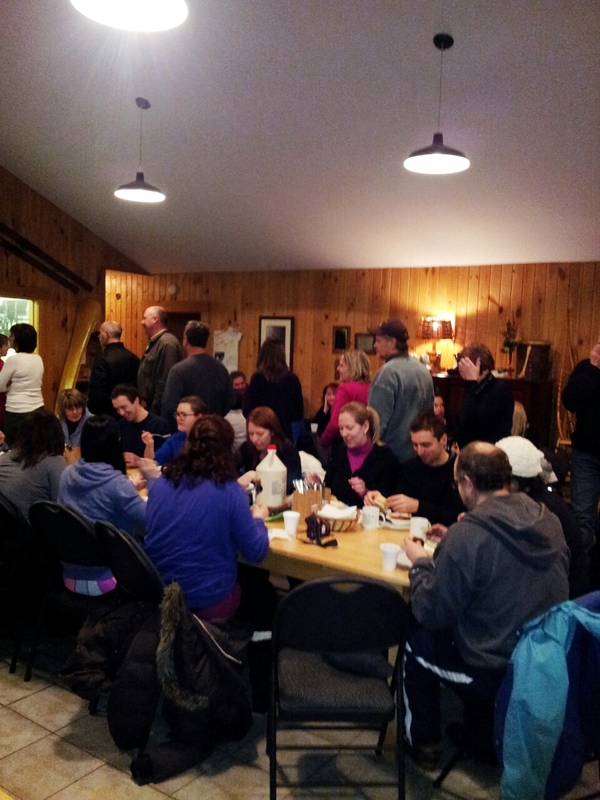 Nearly sixty participants flooded into the lodge the night of my first Moonlight Hike. 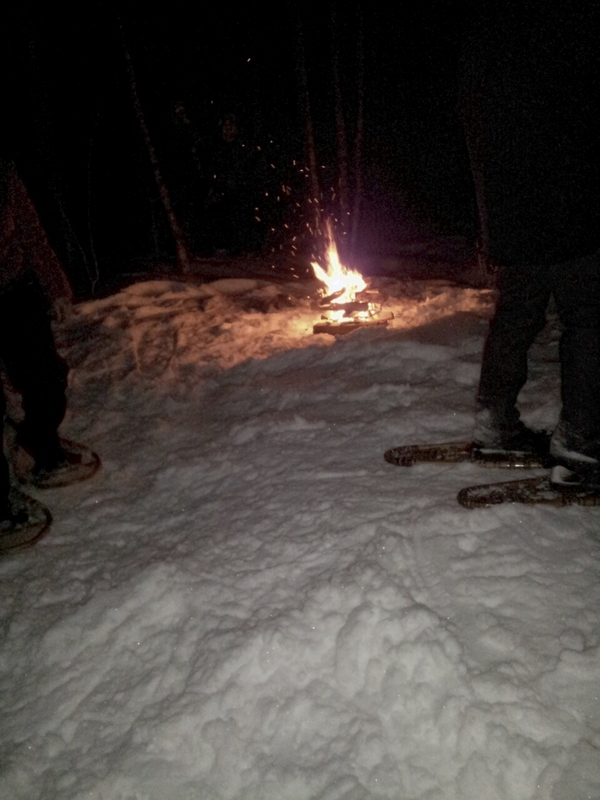 Young and old, beginners and seasoned, came for an evening of snowshoeing and socializing in the countryside. It was a leisurely, but steep trek up the hardwood ridge of maple and birch. The moon was obscured, but the snow offered enough light to see the black outlines of the trees. We stopped often to catch our breath, chat and help beginners adjust bindings. 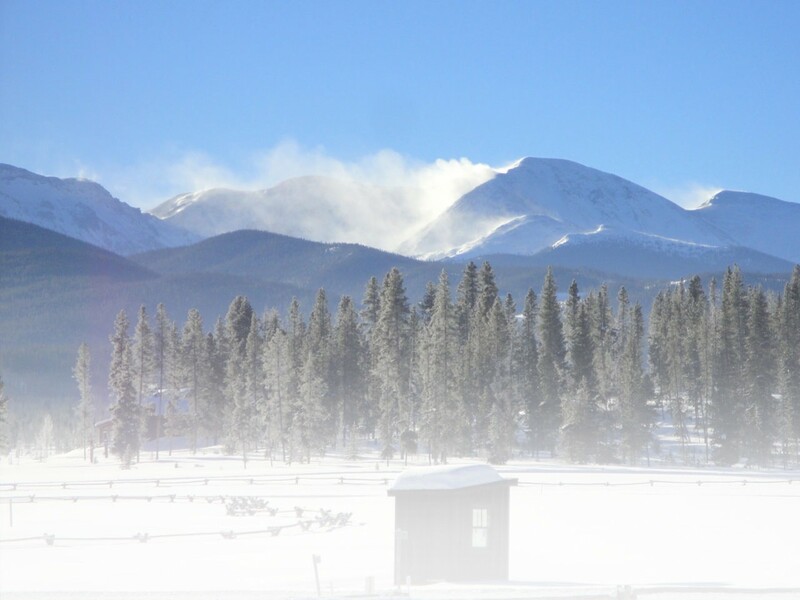 There was no wind and the temperature was a balmy -4 degrees Celsius (25 degrees Fahrenheit). We’ve had generous amounts of snow this year in New Brunswick, so conditions were excellent. Gig, our lead hiker, lit a small bonfire at the top of the ridge. The orange glow lit up the woods and helped color the black and white world of the moonlight hike. Lots of laughter and friendly banter among strangers made it feel like a real old-fashioned social. We chatted with new acquaintances for about twenty minutes then headed back to the lodge for more socializing. The hike was about an hour and a half from start to finish. Back at the lodge, two choices of delicious homemade soup—sausage and kale with orzo, and chickpea with dumplings—fresh biscuits and hot drinks were waiting for us. Denise made everything fresh and from scratch that afternoon. She also served up chocolate chip cookies the size of small cakes and sweet, moist gingerbread with real whipped cream. It was the perfect finish to a great evening. We sat at handcrafted tables and benches made from ash, maple, and birch sourced from Elmhurst’s woodlot. The walls of the rustic lodge are decorated with native baskets, deer and caribou heads, and vintage snowshoes. And the antique wooden rockers, old leather armchair, and steamer trunk coffee table surrounding the woodstove was a warm welcome after the hike. Gig had us guess the origins of two pair of vintage snowshoes–a long pair with a tail and a pointed curl at the toe designed by the Ojibwa, and the more common oblong with a tail from the Algonquin Nation. It was a great reminder of how far we’ve come in snowshoe design and materials. I had the pleasure of chatting it up with a group of twenty-somethings who had never snowshoed before. They definitely enjoyed themselves and were already making plans for their next trip to Elmhurst. And another young woman, new to the area and relatively new to snowshoeing, came on her own, eager to meet new people. I spotted her in the lodge at the après snowshoe meal deep in conversation with a table of strangers. Maybe it’s time to reinstate snowshoe socials in my neighborhood. No doubt we’ll still have lots of snow cover for April’s full moon in New Brunswick. This entry was posted in Destinations, Features, General, Homepage Featured by Rose Doucet. Bookmark the permalink.